Computer Architecture 5 Edition The computing world today is in the middle of a revolution: mobile clients and cloud computing have emerged as the dominant paradigms driving programming and hardware innovation today. The Fifth Edition of Computer Architecture focuses on this dramatic shift, exploring the ways in which software and technology in the cloud are accessed by cell phones, tablets, laptops, and other mobile computing devices. 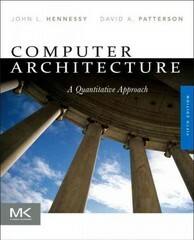 Each chapter includes two real-world examples, one mobile and one datacenter, to illustrate this revolutionary change.Part of Intel's 2012 Recommended Reading List for DevelopersUpdated to cover the mobile computing revolutionEmphasizes the two most important topics in architecture today: memory hierarchy and parallelism in all its forms.Develops common themes throughout each chapter: power, performance, cost, dependability, protection, programming models, and emerging trends ("What's Next")Includes three review appendices in the printed text. Additional reference appendices are available online.Includes updated Case Studies and completely new exercises.